LalitaDasika, also known as Inga Karpiča, is a musical artist from the country, Latvia. In 2013, Lalita fell in love with Latvian folk songs and started to incorporate mantras into this national style of music. As one can hear from her performances, her voice has a bright and beautiful tone which gives each composition a comfortable and uplifting characteristic. Lalitadasika discovered her calling for spiritual music while going through some bumpy times in her life. It was during this time that she decided to combine the two things she has always loved most: spirituality and music. After choosing this new direction, Lalita committed all her time to create music for the soul. She became greatly inspired and started to compose songs, give concerts, and organise folksong-singing meditations. Over the years, Lalita Dasika has grown greatly in her musical and spiritual path. 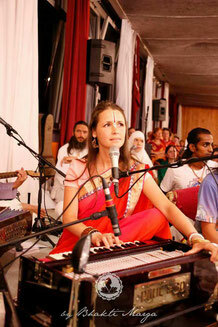 She has travelled around Latvia and abroad to share with everyone the joy and love found in the union of music and mantras.